Synopsis: The Vatican Cathedral is packed to the rafters as Pope Gregory XVII leads the congregation in mass. A cloaked stranger steps suddenly and fearlessly towards the altar and commands the wheelchair-bound Pope to stand. Because the question on everyone's lips is what the stranger's arrival might mean...and whether it finally heralds the End of Days. I picked this books because of the cover. It screams conspiracy thriller type book. You know the ones I'm talking about. 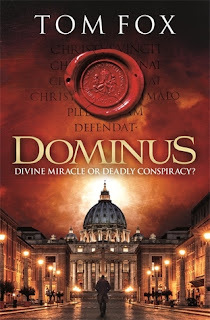 The Dan Brown's and Scott Mariani - two authors who really got me hooked on the genre, and its a cover I really enjoy. I think however, that my love for this type of genre has lead to me to holding certain expectations from books and so when i'd finished this book and hadn't gotten what I wanted from it i'd almost felt a bit let down. But that being said, not all book in that genre should be the same, else i'd just be reading that same things over and over again and so I had to strip back as many of my preconceptions as I could and look at the book as itself, and it was an enjoyable read. 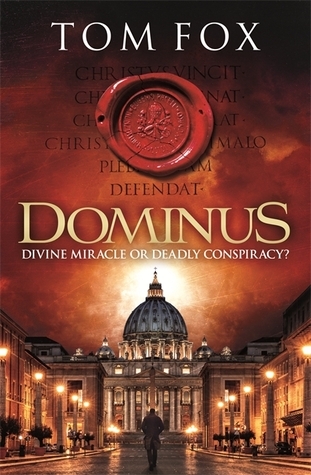 In a lot of books like this, there are some set staples of convention, one of these being the vatican. I find church setting fascinating, and I love when authors bring in characters such as the pope or a king, because its always interesting to see how they do them, and here I feel like I was reading a pope. I felt like I was inside the vatican, and allowed to embellish and create the settings and I had no disbelief in that. I also think disbelief was an interesting word to use here (well I wold, wouldn't I) because a lot of the context of the book deals with the ideas of belief and how far one's belief will stretch in times, and that was one of the aspects I really enjoyed. I don't think this had the high level of tension I was looking for. The characters had car chases and gun fights but there was that element of spark missing. The book flowed well yes, but there was just something about it that didn't ignite a passion within me. Alexander was a nice character, as a former priest he had connection and investment in the plot and it gave him a difference to work with against Gabriella, former liver and pious catholic. There was a lot to these characters but even with this there was possibly less charisma than I was hoping for. But again this could be based on my reading of the genre. That being said however I have bought the two kindle Prequel and Sequel short stories but I am still interested as it did keep me going enough to feel like I could read more. This was a nice and easy read with some good moments to trigger and keep interest but overall not the best of it's kind that I've read.